CFMulti opens new possibilities for CompactFlash (CFII) equipped devices. Most excitingly, CFMulti enables CFII based digital cameras to use Eye-Fi™ WiFi SD Cards to wirelessly transfer their photos just like SD based cameras do! Simply slip a configured Eye-Fi™ card into the CFMulti, and plug the pair into a CompactFlash Type II (5.0mm) slot. The Eye-Fi™ CFMulti tandem behaves just as if the digital camera has a native SD Card slot. Since most current high end DSLR and late model midrange digital cameras feature CompactFlash slots, CFMulti's ability to provide them with Eye-Fi™ wireless protects camera investments, while still allowing switching back to high performance UDMA CompactFlash when WiFi capability isn't needed. 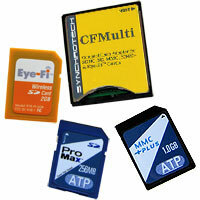 CFMulti also allows the use of SDHC, SD Cards, MMC +Plus, and MultiMediaCards in place of CompactFlash. This multiple card capability is handy when an assortment of cards are on hand. When economy is more important than speed, large capacity MMC and SD Cards are less expensive than high performance CompactFlash Cards. Works with a wide range of devices with CompactFlash Type II (5.0mm) Slots including: Digital Cameras, PDAs, and Digital Picture Frames. Eye-Fi is a registered trademark of Eye-Fi, Inc. All other trademarks are property of their respective owners.